The Stanley Hotel, known for its architecture, magnificent setting and famous visitors, may possibly be best known today for its inspirational role in Stephen King’s novel, The Shining. 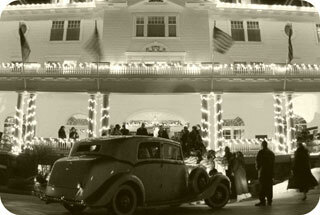 The hotel has been featured as one of America’s most haunted hotels and with the numerous stories from visitors and staff, the Stanley Hotel continues to “shine” today, as it did in 1909 when it first opened. Forced by poor health to move west, F.O. Stanley and his famous Steamer automobile arrived inEstes Park, Colorado in 1903. Finding the town lacking amenities, F.O. set out to change the local economy. On the 160 acres he purchased from Lord Dunraven, Stanley first built the main building of the hotel, one of 11 buildings in the original complex. Many of those original buildings are in use today on the remaining 55 acres. Where the ice pond, water reservoir and 9-hole golf course once stood, you may now see a lone coyote or grazing herd of elk. Construction of the main building began in 1907 and took two years to complete. It was built withsteel support beams and timber cut from land now known as Rocky Mountain National Park. Most of the timber came from the Bear Lake burn in 1900, which may account for the faint smell of wood smoke that can be detected on a warm, summer day. F.O. Stanley also helped to shape the future of tourism in Estes Park. He built the road from Lyons, over which he brought visitors, riding in a Stanley Steamer, to Estes Park and the Stanley Hotel. This marks the first time in history that an automobile, instead of a train, was used to transport guests to a resort area. By his dying year in 1940, Stanley had not only built his grand hotel, but also developed a sewer, power and water company, as well as Estes Park’s first bank. F.O. was also instrumental in helping to restore wildlife to the area, promoting the establishment of Rocky Mountain National Park and Estes Park’s fairgrounds, Stanley Park. Having recently celebrated its 100th year in operation, The Stanley Hotel continues as the most prominent fixture in Estes Park, contributing to the economic wealth and beauty of this once rustic mountain town.